I like to take pictures. This is taken on Kelly Drive. 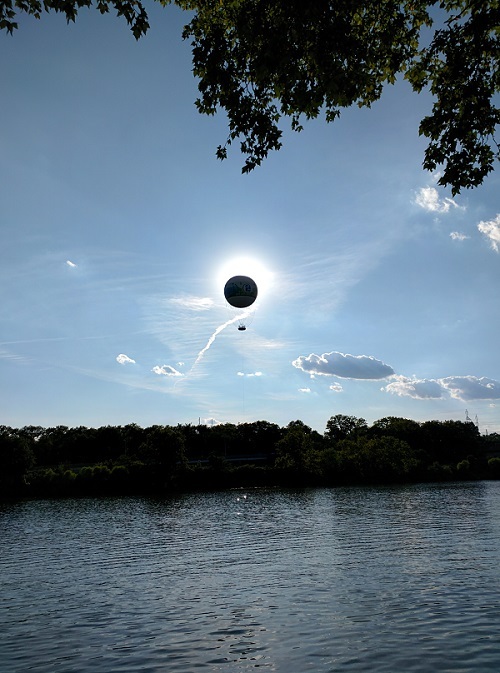 I call it "Eclipse of the Balloon." The Zoo balloon that is. I will be adding to my collection of photos in the future. This is my current bicycle. A Santa Cruz Tallboy LT (for Long Travel). 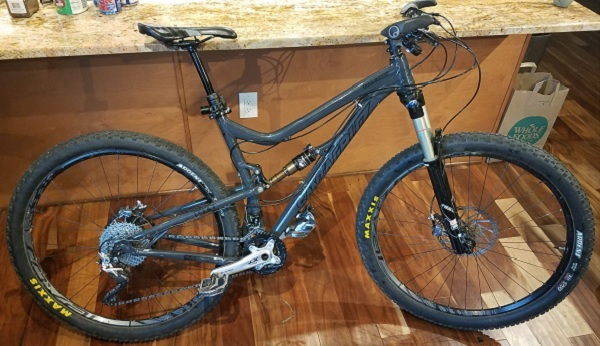 It is an aluminium trail bike with a dropper post and enough suspension for any downhill trail I might want to attempt, along with plenty of maneuvarability for the tight singletrack of Belmont Plateau. With its 2x10 drivetrain, it can crawl thru the slowest inner city traffic but has enough pop to move quickly when needed. My Kona Big Rove ST. This is now my City bike. 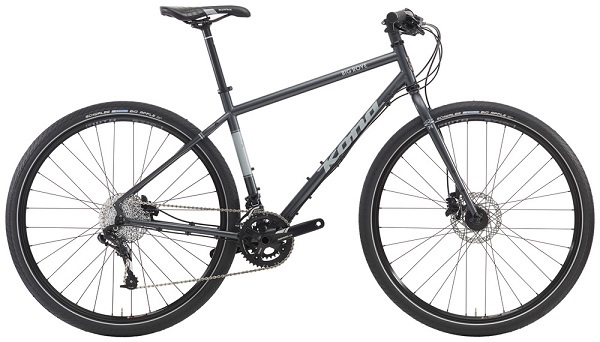 It is a steel adventure bike with roots going back to pre-suspension mountain bike era. It is a go anywhere, do anything bike that is ultra low maintenance. The perfect urban cruiser with its 2" wide semi-slick Schwalbe Big Apple tires, the ride is very comfortable. Particularly if you keep the air pressure at the low end of the tire's pressure range. I've upgraded the wheels to serious MTB quality. There is a handbuilt MTB i23 Team rim with the classic Shimano XT hub in the rear. And in front I bought a Stans ZTR Arch EX i21 rim mated to a Chris King hub via butted spokes. Both of these tires are bomb proof. Which is almost a necessity with Philadelphia's awful streets. Untill I got my Santa Cruz Tallboy LT, I equipped these with Maxxis Crossmark IIs and did a lot of singletrack in fantastic Bellmont Plateau trail system. 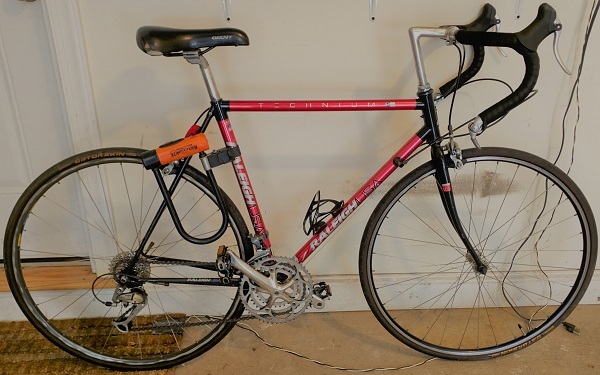 My last road bike was a Raleigh Technium Pro. I bought it for less than $100 off of Craig's List. I modified it myself with new brake levers and the drive train components from a Proteus that my friend gave me after he destroyed the front fork. Another Craig's List find. This Trek Mountain bike had a totally corroded front fork which I replaced with a Surley Krampus ridgid fork. It was my first bike with disk brakes. What a difference disk bkakes make. They are significantly more powerful and the braking power can also be modulated. My first Mountain Bike. 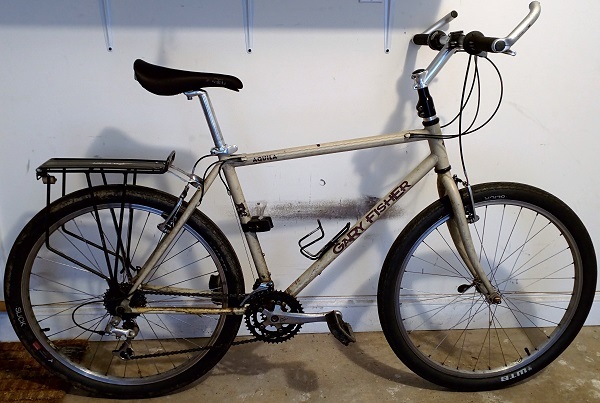 Bought in 1993 before suspension was a thing on Mountain Bikes. After riding it into the ground for 20 years, replacing a couple of cassettes and the middle crank ring, the wheels started going. Spokes were popping. Rims weren't staying true. It was either a new set of wheels or a newer bike. 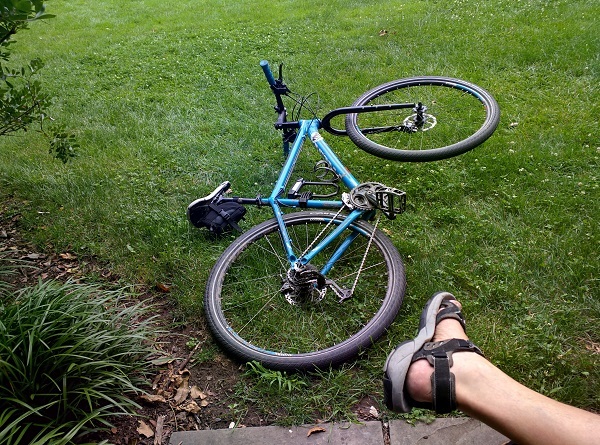 Newer bike won.